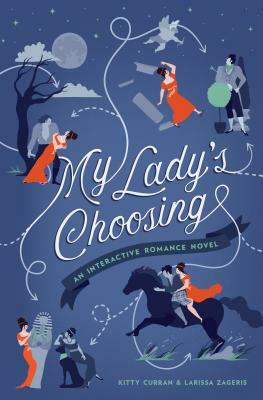 You are the plucky but penniless heroine in the center of eighteenth-century society, courtship season has begun, and your future is at hand. Will you flip forward fetchingly to find love with the bantering baronet Sir Benedict Granville? Or turn the page to true love with the hardworking, horse-loving highlander Captain Angus McTaggart? Or perhaps race through the chapters chasing a good (and arousing) man gone mad, bad, and scandalous to know, Lord Garraway Craven? Or read on recklessly and take to the continent as the “traveling companion” of the spirited and adventuresome Lady Evangeline? Or yet some other intriguing fate? Unexpected and multiple intertwining storylines make this novel a daring delight to read again and again, with beguiling illustrations bringing all the lust and love to life. Larissa Zageris and Kitty Curran are the creative team behind the hit viral Kickstarter project Taylor Swift: Girl Detective as well as countless other zines and comics. Larissa is a writer, educator, and photographer whose work has appeared in McSweeney’s Internet Tendency, among many other internet places. Kitty is an illustrator and comics artist who is Actually British and knows all about courtship rituals, the peerage, and upper-crust accents.